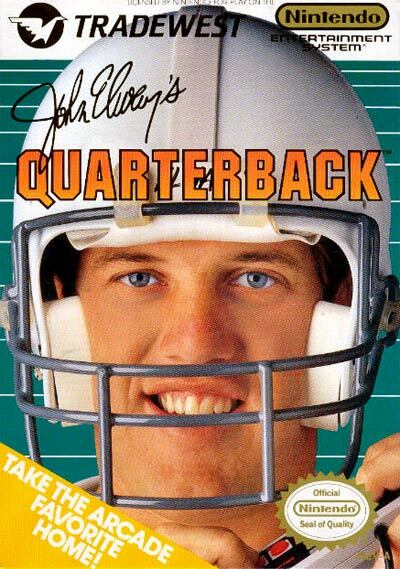 In John Elway's Quarterback, it's one player vs. the computer or two human players going head-to-head in single-game American football action. Select your team's home city (there is no NFL or NFLPA license, so there are no real teams or players) and then battle the opposing team for four 15-minute (accelerated real-time) quarters. Graphics are simple: one team has blue uniforms, the other team red ones. The human player gets control of the quarterback on offense and the middle linebacker on defense. The play perspective is top-down and vertical-scrolling. Choose from 9 offensive--mostly passing--plays and 6 defensive plays. Teams have 9 players each.